As shooting involves the use of guns (sometimes highly dangerous ones), safety is obviously an important element of the sport. It’s vital to know how to handle a gun in the safest possible manner so that you’re not posing a danger to both yourself and other people. Many shooting clubs can advise their members on shooting safety if asked so they are a good initial point of call for new shooters. The most important safety rule is to unload your gun when you're not using it. It's all too easy to accidentally knock or nudge your gun while you're on the move (negotiating a fence, for example) if it's still loaded. Don't aim the gun in the direction of anything that you're not intending to shoot, and always make sure that the muzzle is pointing in a safe direction at all times. Likewise, make sure that you have a solid idea of the area that you're aiming at before you commit to the shot, and don't shoot at anything that is floating on or just above the water or that is sitting on a flat and hard surface. Bullets can easily ricochet off at a dangerous angle. When you're not using your gun, keep it in a safe place along with the ammunition. 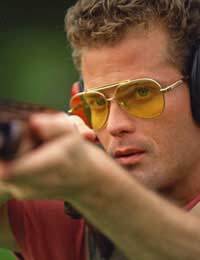 If you value your sight and hearing, it's essential to wear safety glasses and some sort of hearing protection (like earplugs) when you're ready to shoot. There are three popular shooting positions: lying on the ground, sitting/kneeling and standing. Of the three, the first option offers the best balance and stability, although many shooters prefer to be sitting on the ground to gain a bit of extra height. Standing is the most difficult position and offers less stability. This refers to the skill of releasing the trigger without affecting the sight alignment. The ideal method revolves around pulling back the trigger with one finger without allowing the rest of your hand to apply any pressure. It often hinges on where your finger is positioned on the trigger when you pull back. Trigger control is harder than it sounds, especially if you're not an experienced shooter. Ideally, the correct finger placement should be in between the fingertip and the first joint of your finger. Finger placement isn't the only thing you need to perfect. You also need to be able to apply a slow but constant pressure to the trigger (rather than a fast pullback) so that the rifle doesn't move while you're pulling the trigger. Breathing is another important element that is often overlooked. Once you have the right sight, take a deep breath and partially release and hold this breath as you squeeze the trigger. A lot of shooting safety is based on common sense, but this doesn't mean that all shooters necessarily stick to the guidelines. Some of these tips aren't immediately obvious to beginners though, especially those related to trigger control. Most shooting clubs will happily advise new members on safety basics, but it looks more professional if you’re already clued-up when you join. On a driven game shooting day, if you have been told no ground game during your safety talk, also reiterated on your shoot cards, as a picker up what can you do if a gun decides to shoot a runner on the floor on uneven turain? You should seek legal action against the shooter and also the game shooting day provider. As a non shooting person, how far from a residential property should shooting actually take place.Today I had a number of guns some, less than thirty feet from my property shooting pheasant, teal, mallards etc. with shot raining down on my roof at times.Not amused, apart from the fact that I think the practice is barbaric, I do fear for my own safety at times.